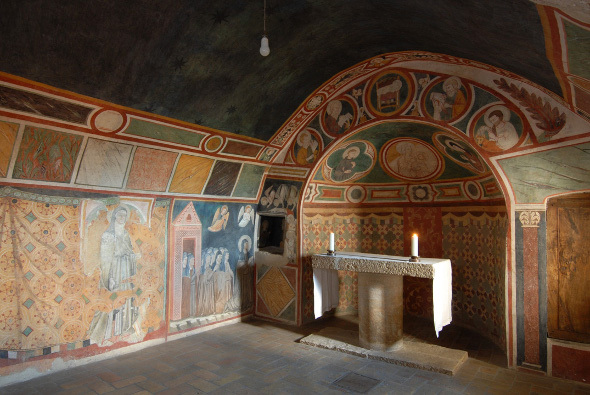 >> Do you want to see Assisi's churches? Check it out now of the best hotels in the vicinity of Assisi. In this countryside oratory, just outside the walls of the village, during the summer of 1205 after Christ St. Francis feels the Crucifix, that nowadays is kept in the chapel of the same name of the Basilica of St. Clare, exhort him to restore the church; in the cave under the edifice, the Saint hided himself from his father who was obstructing his monastic choice. 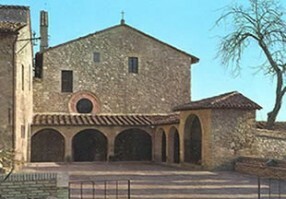 Here St. Clare spent her monastic experience from 1212 after Christ and founded the Order St. Clare; in the "small hut of linens in a corner of the house" San Francesco wrote the first draft of the Canticle of the Creatures, and in the dormitory of San Damiano, Santa Chiara died on August 11th of 1253 after Christ, just two days after the visit of Pope Innocent IV. There are offers for b&b in the areas of Assisi! Click and Consult them immediately. What mostly moves of the place is the silence, and the sense of secondment that whoever feels going from the village to this church; San Damiano is only, after all, a little bit more than one kilometre away from the Basilica of San Francesco, but, maybe for the olive fields around it, or maybe because it is visited more from pilgrims praying than from simple tourists, the distance seems to be a lot longer. >> If you've decided to see Assisi's churches you should contact now farmhouses in its vicinity >> click this link.